Over the course of the last three years ExchangeWire has witnessed real time bidding emerge from a technological unknown to an established method of media buying. We are now at a point where, although automated-led buying still has room for much more growth, the marketplace has started to mature. We are not seeing the launch of a new start-up every day, attempting to solve an unnecessary problem within the ecosystem. We have seen publishers, ‘premium’ and otherwise, begin to invest, not only to understand the future dynamics of software-led buying, but also to try to gain competitive advantage. Some of the largest publishers globally have done this: Microsoft being one of the most prominent examples, selling real-time based homepage ad slots through its Appnexus-powered exchanges. We have seen advertisers move large proportions of their non-guaranteed display buying directly into the exchange environment via their agency trading desks/preferred trading partners as well as indirectly, via the wider pool of now RTB-enabled ad networks. Some big advertisers have begun to explore in-housing some of this work, and now employ people responsible for putting together and coordinating various technology stacks. 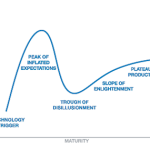 If we had to pinpoint a particular point on Gartner’s trough of disillusionment, it could be argued that we are now somewhere between trough of disillusionment and the slope of enlightenment. The hype cycle is officially over. We’re no longer talking, we are doing — and we’re now starting to get over the inevitable crash that any hype cycle brings. The marketplace, and all of its ecosystem participants, now have a firmer grasp on how to move forward and how to mature their approach and strategy, based on their specific needs, rather than following the latest craze popularised by trade publications. We are at the point of iteration and perfecting. This does not mean that the growth of spend through software solutions, like DSPs and guaranteed-buying platforms like Shiny Ads and isocket, will start to diminish. It just means we are now building on the layers of knowledge, insight and experience that have thus far been amassed. During the phase of hype, hyperbole, growth, and now, hopefully, maturity, the actual vendors in ad technology have also seen their own businesses evolve and iterate. Although much growth has been witnessed over the past three years, it is unsurprising that the focus of businesses is still so closely aligned to the delivery of better performance for advertisers. As the market evolved, so too did the technology and opportunity for companies to continue to refine and improve. Scaling technology, more advanced use of data and increased insights and personalisation on an individual user are not unique to specialists like Sociomantic and the way its business has evolved. The RTB boom also paved the way for a collection of smart and innovative trading specialists to emerge – companies that did not necessarily need to take on huge investment to replicate the plumbing being laid by the scaled infrastructure ad tech companies in the space. Instead, they mostly bootstrapped and innovated through more advanced understanding of the detail. They built on top and around existing platforms like Appnexus, a vendor that has cleverly positioned itself as being the platform of choice for these specialists. Companies like MediaIQ, Infectious Media and BannerConnect are good examples of how you need to continually innovate to stay relevant and competitive. They have developed renowned expertise in data analysis and sophisticated bidding capabilities. They’ve developed their own technology and data infrastructure around platforms like Appnexus, MediaMath, and IPONWEB in order to continue to scale and develop their end product. Agencies have been heavily involved in shaping the growth and roadmap of RTB and automated buying. When Search Marketing first emerged, it is fair to say the traditional agencies were slow to really develop credible expertise. They got quickly left behind at the hands of search specialists, a few of whom built great businesses that resulted in a number of sizeable exits. In the case of RTB, however, agencies refused to repeat the mistakes made in the past. Everyone understands the investments and resources that the holding groups put into establishing their trading desks, and these early investments paid off. Today, these trading desks, globally, represent a significant percentage of overall investment; and it has been a much shorter (but still challenging) journey versus the search marketing scenario. What everyone is perhaps more unaware of, however, is what lies beneath these trading desks. How have the individual agencies adapted and adjusted to this vastly disruptive force? How significant has it become? For Starcom MediaVest Group, RTB has grown to become an increasingly large part of display investments, with further increases in growth on the horizon. John Baylon says the growth will come from, “1) the continued détente in the attitude of publishers releasing RTB-enabled inventory to the market and, 2) the continued development and innovation in RTB technology solutions (eg. video/ mobile, customised bid algorithms)”. Much of SMG’s RTB investment is enabled by VivaKi’s Audience on Demand and key to this success Baylon cites is, “the integration of AOD into our overall buying strategy, dovetailing and complimenting our more traditional direct managed buys, combined with working openly and collaboratively with publishers to help grow the business opportunity”. Baylon makes the point that close integration between agency and trading desk is critical to leveraging its full benefits, and predicts that it will become an even more critical capability in delivering results for clients. It is clear, in the case of Starcom MediaVest Group, RTB-enabled buying has become a permanent fixture in the way the agency invests client budget, and as a result it has revolutionised traditional trading methods. But looking beyond the impact of agencies from a trading perspective, it has also led to an increase in technical expertise. While the trading desks may hub a lot of spend, certain operating agencies have made conscious efforts not to outsource all intellectual value. Despite the advancements made by some within the industry and the growth and percentage of spend that RTB has grown to command, there is still a feeling of missed opportunity among some senior figures in the space. We cannot underestimated the impact RTB has had on the industry as a whole. Over the next 12-24 months, we will begin to see innovative companies pulling away from the rest of the pack. The time for riding the wave of RTB hype is effectively over: the successful companies in this space will innovate, iterate and evolve the existing model of real-time buying and trading. This could arguably be the most exciting phase of the RTB growth journey.